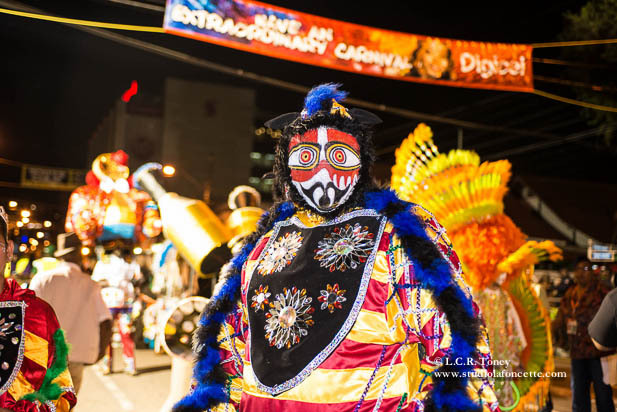 Ronald Alfred, leader of the oldest existing Jab Jab troupe in Trinidad carnival. The term Jab Jab comes from the French word for devil – diable*. Said quickly it sounds similar. The Jab Jab is traditional mas and also considered pretty mas for it’s lovely satin costumes and beading. Ronald Alfred, pictured above is leader of one of the oldest Jab Jab troupes in T&T. He practices an art passed down by his father and grandfather and teaches it to youth, including his children. He explained to me that the mas is a sacred act. Their whips are hand tied and herbs are interwoven in the fibres. They take this art form very seriously and are dedicated to the significance of the mas. Here’s a nifty new website developed by a (US) Fulbright scholar and some others www.traditionalmas.com telling you more about Jab Jab. It includes a pretty cool interview with Mr. Alfred. It’s hard not to like Ronald Alfred. He is passionate about what he does, he’s dedicated and works very hard with youth on passing on the tradition and when he talks to you he lights up with enthusiasm and pride in the tradition. That energy flows into his interviews and in his portrayal. Here are video clips of them in action. Forgive the shakes. I’m still working on my camera steadiness – a still life gal aiming to make it in a multimedia world. *It’s worth repeating here a tidbit about Trinidad’s heritage. It was colonised various times by the British, Spanish, Dutch (once). In the 18th century during Spanish rule the Cedula de Poblacion was a mechanism by which Spanish colonisers enticed French slave owners to settle the island, allowing more acres of land (none of them really owned) for every enslaved African (who also incidentally they “owned” according to their laws, but had no earthly right to). Consequently the island (Trinidad, not Tobago) was governed by Spaniards, populated largely by an influx of West Africans who spoke African languages – lots of Yoruba, Igbo, Akan languages like Twi, Hausa, and a French-based patois similar to Haitian kweol.